Amanda, Author at Cintar Inc. 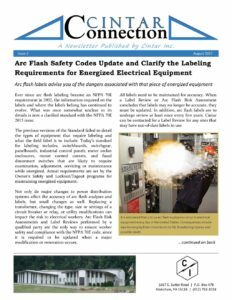 In this edition of Cintar Connection we take a look at arc flash labeling. 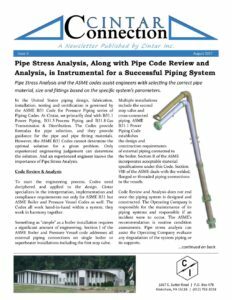 The NFPA 70E labeling requirements were updated in 2015, and with this update came some clarifications on the types of equipment that require labeling and changes to the information required on labels. Along with the labeling, NFPA 70E 2015 requires training/retraining every 3 years. At Cintar, we emphasize the importance of understanding the methodology behind how equipment is labeled in order to keep personnel safe around energized equipment. We work with facility Owners to create, update and train based on each site’s specific hazards and risks. 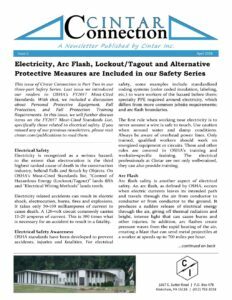 Click here to read about our Arc Flash and Electrical Engineering capabilities. Since the inception of Cintar Inc. in 1983, we have focused on the interests of our clients. We provide the consistent high quality service our clients deserve. And our latest creation is no different. Given the ever-changing climate of rules, regulations, technology and trends, it can be difficult for our clients to keep up with or fully understand how these changes may affect them. At Cintar, we purposely select exceptional staff members. An aspect of being exceptional is keeping up-to-date in their field and helping our clients stay informed. 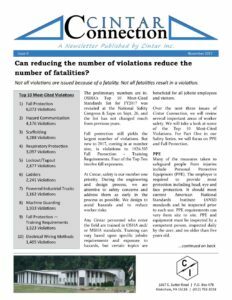 Cintar’s dedication to our clients led us to create the attached Cintar Connection newsletter. 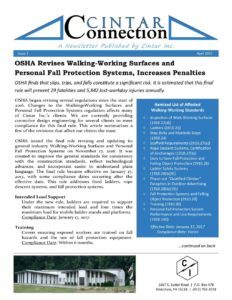 Our managerial team reviewed this first issue and selected the recipients they felt would benefit from its contents, revisions to OSHA Walking-Working Surfaces and Personal Fall Protection Systems regulations. Cintar Connection will focus on what matters to Cintar’s valued clients. After you read our publication, pass it along to your colleagues. Our goal is to spread the wealth of knowledge of our staff so that our clients and their colleagues can benefit. Click here to read more about our Structural Engineering capabilities.